So what is the major difference between your tripod and those expensive video dollies? Wheels! If you look on YouTube, you will find many people showing their Do-It-Yourself solutions for a video dolly. Many involve taking skateboard wheels, strapping them to a board and then mounting your camera on top. It turns out, that the tripod manufacturers also had the same idea. Manfrotto has several dolly accessories ranging from $120-$1200. But, would you believe the above generic dolly was only $40, using the same idea as the more expensive solution?!! Your tripod legs are clamped in very securely to the base. Each wheel has a kick lock. Two of the dolly legs fold back for easier transport. Easy. On smooth floors and low-pile carpets, the dolly produces very smooth movements suitable to HD Video. However, on something uneven like the wooden boardwalk in the photo, the video was a bumpy mess. I actually did produce smooth movements on this boardwalk by using a 3’x5′ rug runner to smooth out the surface. A little short, but I was able to spin the dolly with very smooth movement. Next time, I would bring a longer rug runner (3’x10′ or longer). Certainly cheaper and easier to transport than any rail system. The video dolly in the above photo was purchased from CowboyStudios in Dallas. But, it is no longer listed on their website. 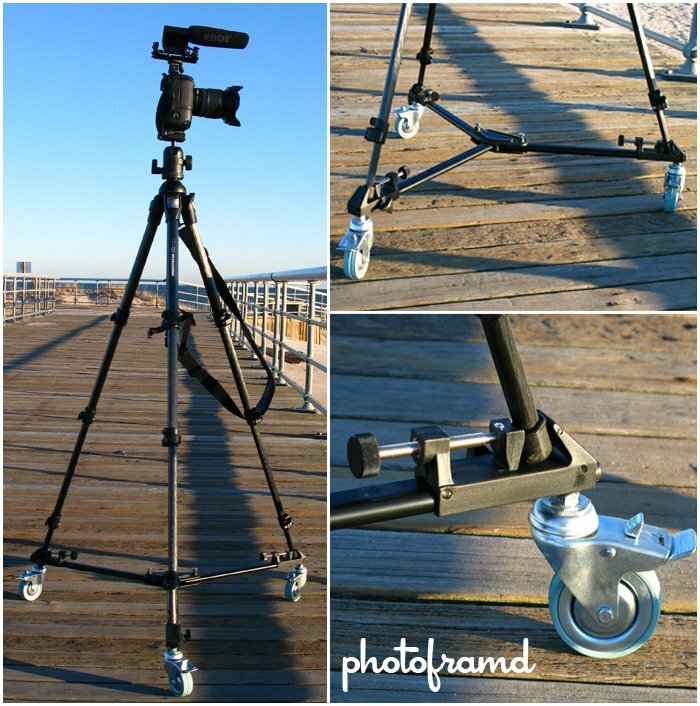 I checked Adorama and they offer a very similar tripod dolly also under $40. Before you spend time creating a do-it-yourself dolly solution, take a look at one of the off-the-shelf dolly solutions for under $40.